Taipei, Taiwan - July 5th 2016 - Thermaltake today officially released the Core P3 Snow Edition ATX Wall-Mount Chassis and the Core P3 Black Edition ATX Wall-Mount Chassis. 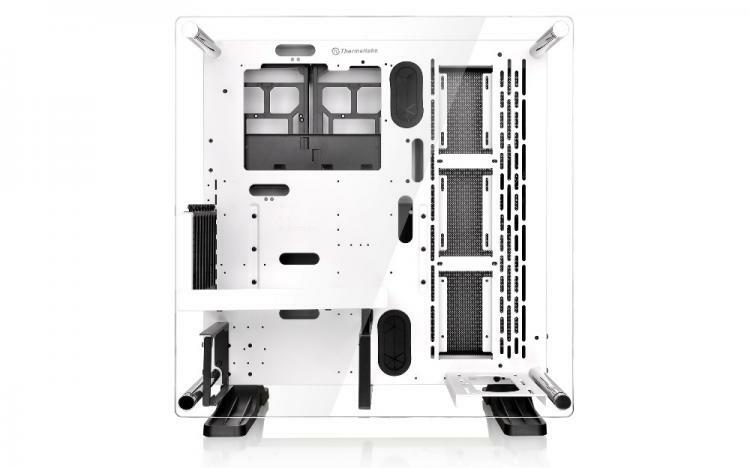 The Core P3 series retains the classic appearance of the Thermaltake open frame chassis series. To simultaneously protect and display the glory of the build, the Core P3 series is designed with 3-way placement layouts (Wall-mount, Horizontal and Vertical) as well as included a large acrylic window. The internal structure of the Core P3 series provides a versatile PSU and GPU orientation, and supports a vertical PSU layout. Furthermore, the dual GPU layout locations allow flexibility for placing the GPU either horizontally or vertically. Most importantly, the Core P3 series is AIO liquid cooler supported. The Core P3 series is not only made for modders, but also built for makers. Users can make their own Core P3 mods by downloading the 3D printable accessories available online. By practicing and incorporating the idea of “Maker Movement” as well as 3D printing in Thermaltake Core P3 series, Thermaltake designs the open frame panoramic viewing chassis that allows anyone to make their own mods by printing out ideas using 3D printer with liquid cooling components. All the files are available to download on 3dmakers.thermaltake.com. The Core P3 series is designed for use in three different ways: Wall-mount, vertical, and horizontal placement. Built for customization that reflects the makers’ personality, the Core P3 series allows users to adjust the chassis for the best viewing presentation while ensuring outstanding cooling performance. Users can choose to hang the Core P3 series on the wall as decoration, or display it on any surface of their choice either vertically or horizontally. The open frame structure with unique Panoramic Viewing design advances the Core P3 series visual presentation, that permit users to show off their dedication and skill set unlike any other cases on the market. The Core P3 series enables user to freely build the system from the ground up with given modular panels, racks, brackets, and pre-design mounting arrays. With no more unreachable screw corners or gaps, the Dismantable Modular Design makes installation easy. Users can easily show off their graphic card and power supply with the specially designed bracket. The Core P3 series has included the Thermaltake PCI-e X16 Riser Cable that allows users to choose the way they want to build the system. The Thermaltake PCI-e X16 Riser Cable supports a wide range of GPU solutions and match the cable included in the Core P3, protecting your GPU investment with EMI shielding and providing high conductivity to one of your most vital components. Furthermore, the Core P3 series also has the support for vertical PSU layout when ITX motherboard is applied. The Core P3 series enables users to build a complete high-end system, whilst supporting up to 420mm DIY liquid cooling radiators, or 140mm case fans, with a long graphic card at the same time, and simultaneously providing the best visual effects as well as increasing the CPU’s case modding potential. 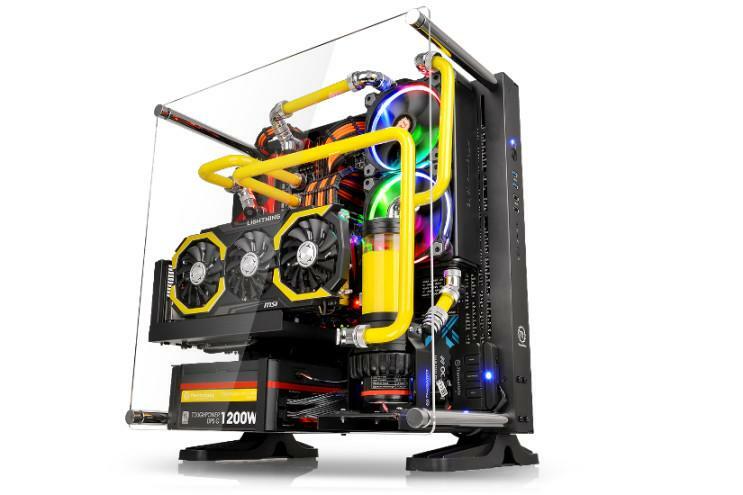 The Core P3 series allows users to install AIO liquid cooler size up to 360mm. Most importantly, the Core P3 series has the capability to deliver an outstanding cooling efficiency throughout the entire case. The Core P3 series offers the most flexible mounting option with the uniquely designed mounting array which not only supports up to four 120mm or 140mm fans or radiators, it also supports the mounting of 3.5” and 2.5” storage devices. Furthermore, two 3.5”/2.5” drive trays are included and hidden in the back panel that offers 45mm of cable management space.